The device Usage statistics shown in iOS Settings > General > Usage offer a quick look at how much capacity is available, actively being used by apps, and their respective data and caches. 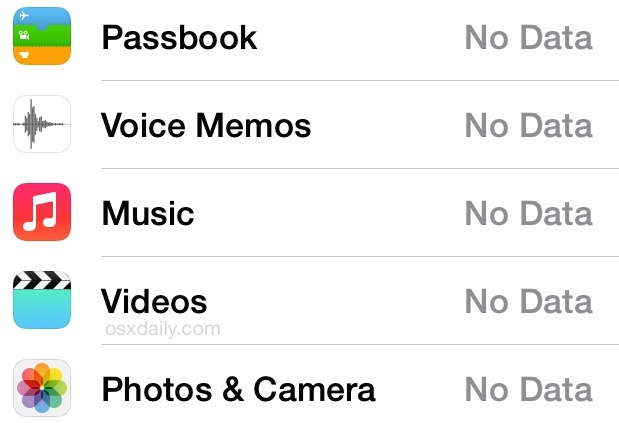 Similarly, usage data is also available to track app cellular data usage. Sometimes these usage statistics will appear blank though, showing a “No Data” message, and no amount of re-launching the Settings app seems to make a difference. If you run into the rather unhelpful “No Data” message and no added details alongside app names in Usage Settings, you can force iOS to recalculate this data by rebooting the iPhone, iPad, or iPod touch. That’s easy to do, just hold down the Power button until you see a “slide to power off” message, turn it off, then turn it right back on by pressing the Power button again. Basically you’re turning the device off and back on again. Once iOS has finished booting again, go back to Settings > General > Usage and you’ll find the app capacity usage and app capacity statistics have been recalculated to be accurate again. Notice the clock has only elapsed 2 minutes? Sure, rebooting isn’t the most convenient thing in the world, but iOS devices are fast enough these days that you should have the entire troubleshooting task complete in a minute or less. Why this happens isn’t entirely clear, but it’s probably just a simple bug, and fortunately the quick reboot process is enough to get things back to normal again. 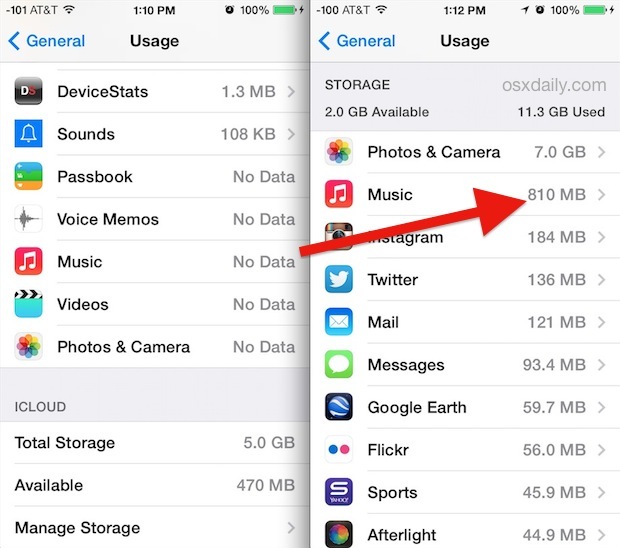 If you know of another way to force iOS to recalculate capacity usage information, let us know in the comments!